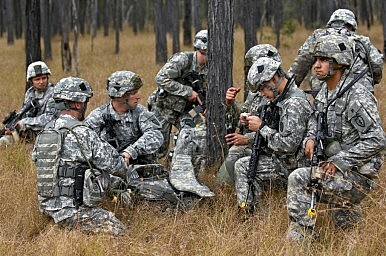 In a move toward security trilateralism, Japan will send troops to join the U.S. and Australia at Talisman Saber 2015. On the heels of high-level bilateral talks between Japanese Prime Minister Shinzo Abe and Australian Foreign Minister Julie Bishop, Japan announced that it will join the Talisman Saber 2015 military exercise. The biennial exercises are a major feature of the United States’ military cooperation with Australia, and Japan’s participation will be a first. As Reuters reported, the announcement comes amid rising tensions over China’s island-building activities in the South China Sea. In addition to Japan’s Self-Defense Forces, the New Zealand Defense Force will also participate in this year’s iteration of the exercise, contributing around 500 troops. Despite the addition of JSDF and NZDF this year, the Chief of Joint Operations of the Australia Defense Force (ADF) Vice Admiral David Johnston emphasized in a press statement that the exercise’s core focus on bolstering bilateral U.S.-Australia interoperability wouldn’t be diminished. “The primary aim of the exercise remains improving Australia-U.S. readiness and the way we operate together through combined training,” Johnston remarked. “While Exercise Talisman Saber remains Australia’s premier bilateral exercise with the United States, it provides an excellent opportunity for the ADF to practice operating with the New Zealand Defence Force and JSDF in a realistic training environment,” he added. Japan’s Defense Minister Gen Nakatani told Reuters that Japan’s involvement in the exercise was not directed at China, noting that his country’s goal was to improve interoperability with the U.S. and Australian militaries. As Helen Clark noted in The Diplomat recently, Australia and Japan are looking to actively increase the frequency and depth of their joint military exercises. A major aspect of this growing cooperation on security issues will likely involve the United States, which is a common ally to both countries and a major power interested in preserving the status quo — certainly on maritime security — in the Asia-Pacific. Australia and Japan began cooperation in earnest on security issues eight years ago, and much has changed in the region in the meantime. While back in 2007, the prospect of an assertive China was less substantiated, today both Australia and Japan see evidence of Chinese revisionism and low-intensity coercive behavior in the East and South China Seas. Additionally, Japan’s shifting posture on national defense under the Abe administration has also reduced barriers to broader cooperation between the two partners. For the United States, it looks like trilateral strategic coordination with Japan and Australia will increasingly be central to the diplomatic leg of its ongoing “rebalance” to Asia. Recently, U.S. Assistant Secretary of Defense David Shear noted that the United States was pursuing “unprecedented trilateral cooperation” to “expand the reach of these alliances.” Talisman Saber 2015 is a small step toward realizing that objective. Is Japan’s Ballistic Missile Defense Too Integrated With the US?US, Japan Move Into Final Portion of Keen Sword 2018 Bilateral Military ExercisesJapan Activates Amphibious Rapid Deployment BrigadeJapan to Study Feasibility of New Long-Range Radar Site in Western PacificHow Did Japan Lose Its Air Superiority Advantage?